Mahatma Gandhi, the great leader of India's freedom movement was influenced by Jain Philosophy. This article gives you information on Gandhi's affinity with Jainism. 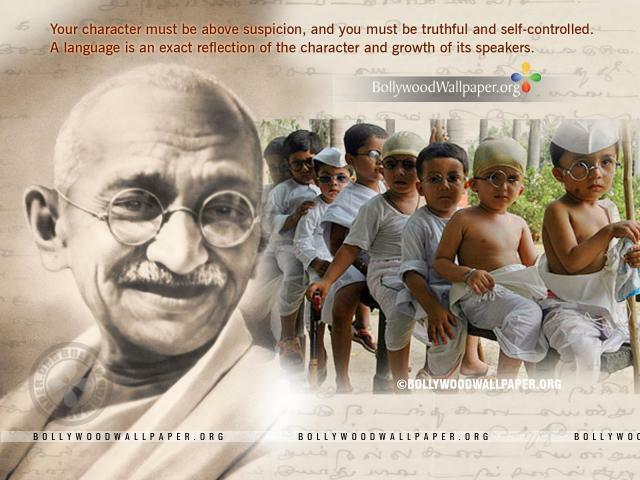 Mohandas Karamchand Gandhi was born in Gujarat, a West coast state of India. Gujarat has a rich history of Jainism. Aritthanemi, the 22nd ford maker of Jainism, who was a cousin of Krishna, promoted Jainism in this region in approximately 10th Century B.C.E. Great Jain kings like Kumarpal and others gave royal patronage to Jainism in this region. Gujarat is the region which gave birth to great Jain ascetics like Acharya Hemachandra, Acharya Sheel Gun Soori, Shrimad Raj Chandra, Kanaji Swami and others. Gujarat and Gujaratis have been always influenced by Jainism. So was Mahatma Gandhi. He was influenced by overall Jain environment of Gujarat, his mother Putalibai's affiliation to Jainism and his friendship with the great Jain philosopher Shrimad Rajchandra. Gandhi was born in Modh Vanik community, a merchant community of Gujarat. This community is influenced by Jainism for many centuries. The great Jain ascetic from Gujarat Acharya Hemachandra himself was from this community. Many Modh Vaniks have contributed in promotion of Jainism and even today, there are many Jain monks from this community. Although most of the laymen from this community are Vaishnavites today, a big percentage of Modhs were followers of Jainism until recent past. We get a lot of information about influence of Jainism on Mahatma Gandhi from his autobiography and biographies. He was born on 2nd October of 1869 in a Vaishanavite family of Porabandar. He was not a Jain by Birth. But his mother Putalibai was greatly influenced by Jainism. Becharji Swami, a Jain monk was spiritual adviser of Putalibai. When young Gandhi decided to go to England for study of laws at the age of 18, Bechar Swami asked Putalibai that Mohandas should take vows. Accordingly, Gandhi vowed not to eat meat, not to take alcohol and not to touch woman. Famous Jain philosopher Shrimad Rajchandra was one of the best friends of Gandhi. Rajchandra was a genius having deep knowledge of Jain philosophy. When Gandhi was in South Africa, he sent a long questionnaire to Shrimad Rajchandra. The questionnaire had 27 questions which were promptly answered by the latter. 1. What is the Soul? Does it perform actions? Do past actions impede its progress or not? 2. What is God? Is He creator of the Universe? 4. Do all religion originated from Vedas? 5. Does any merit accrue by the sacrifice of animals? 6. What do you think about Christianity? 7. Can anyone remember his past lives or have an idea of future lives? 8. What will finally happen to this world? 9. Will the world morally better of in the future? 10. Is there anything like total destruction of the world? 11. If a snake is about to bite me, should I allow myself to be bitten or should I kill it supposing that that is the only way in which I can save myself? Gandhi admits in his autobiography that he was greatly influenced by the thoughts of Shrimad Rajchandra. He puts Rajachandra in number one position in the first three personalities who influenced his thoughts. The other two were Ruskin and Tolstoy. Gandhi adopted all the five vows of Jainism for laymen, with a higher degree. The vows include Non Violence, Truth, Non stealing, Non Possession and Celibacy. But beyond that, he seems to be a true Jain when we see his braveness. We do not see any instance in his movements that he behaved like a coward. He was a brave man without a weapon, throughout his life. Another great influence of Jainism on Gandhi was simplicity and the dress code. He did wear only essential clothing, that too made from cotton. He did wear white only cloths. A clear indication of influence by Jain ascetic's life. As we know, the Jain monks do not use vehicles and wander everywhere on their bare feet. Although Gandhi used vehicles, he is famous for his long marches on feet. His marches were clearly adopted from the practices of Jain monks. That is why we can say that he was a true Jain. Gandhi's greatest contribution to Jainism was that he made Jain principles practical. He applied the principles on large scale involving masses. We can say that he was the first man to apply Jain principles for social and political movements. "No religion of the world has explained the principle of non-violence so deeply and systematically, with its applicability in life as in Jainism.......Bhagwan Mahavir is sure to be respected as the greatest authority on non-violence"
"I say with conviction that the doctrine for which the name of Lord Mahavir is glorified nowadays is the doctrine of Ahimsa. If anyone has practiced to the fullest extent and has propagated most the doctrine of Ahimsa, it was Lord Mahavira"
If you like this blog Please Like it,Plus it and Tweet It.